In 1999, due to the declining number of mule deer in Colorado the Division of Wildlife decided to restrict all deer hunting statewide to a lottery draw system, and the results in GMU #54 have been fantastic. The bad news is, it now takes several preference points to obtain a deer license, the good news is, due to the limitations some really tremendous bucks are being harvested. In fact, several hunting publications have predicted the next state record could come out of one of the game management units in the Gunnison valley. You can expect to see trophy bucks in the 180” – 200” plus class, with widths ranging from 24” – 30” plus. During the archery and muzzleloader seasons, these big mature bucks will be hanging together in bachelor groups high above timberline on the rough ridges and deep basins over 11,000 feet. The buck’s antlers are fully developed by this time even though some will still be in velvet. These glass and stalk hunts are conducted out of our Castle Creek camp, where your guide will lead you on horseback into areas that are highly inaccessible to the common hunter. You must be in excellent physical condition and willing to hunt long and hard to be successful on this hunt. Since the snow has a tendency to run the game, as well as us, out of the high country, our 3rd and 4th season rifle hunts take place on public and private land at lower elevations, as the deer move to the winter breeding grounds. These hunts are during the rut, when the big bucks are chasing does and are a little more vulnerable. But, even during the rut, these big trophy bucks can be very tough to hunt, sometimes lying up for days in secluded, inaccessible areas or at times even going completely nocturnal. They have learned to do whatever it takes to survive, but that is the challenge of a trophy-class mule deer hunt. These hunts are guided out of accommodations in Gunnison and include a single occupancy room at a first-class inn, all meals, transportation, and one on one guide service. This can be a very physically and mentally demanding hunt, with miles of traveling and hours of glassing in an effort to locate one of these trophy bucks. Due to the demands associated with these trophy hunts we offer only a limited number each year, but with very high success. From experience we know where these big bucks hang out and how to get to them, so why not improve your odds with our services. 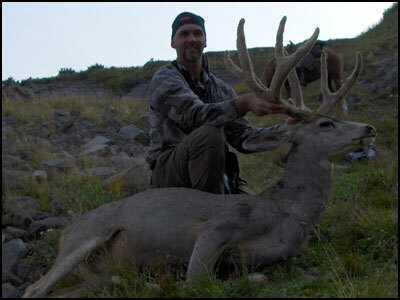 If your dream is to harvest a true trophy-class mule deer, this is the place and we’re your best opportunity. Don’t squander all those years of preference points on an unproductive hunt. Let us help you successfully fill that tag of a lifetime. Give us a call today. Tenderfoot Outfitters has the guides, accommodations, and game rich country to provide a top notch backcountry hunting experience. I have taken 2 mature 190+ class mule deer in two trips. during the past few years, deer license have been cut by 40-60 percent throughout the Gunnison Basin. Those who draw a license will still see good numbers of deer and many mature bucks. Relatively few licenses are made available, but the success rate for those who do draw are typically above the statewide average.